*Promotion valid just for new students. The longest and most successful Cuban salsa classes in London. EVERY FRIDAY Cuban Style Salsa & Rueda de Casino with Esther, Antonio & Anier plus regular guests teachers. The club has a great, relaxed atmosphere and authentic Latin flavour. Main Room: Cuban Music from 9:30-11:00pm followed by the best Salsa, Merengue & Bachata by DJ Fercho "KB-Son" until 3:30am. Upper Room: Reggaeton, Merengue & Latin Commercial. Doors open: 6:30pm (please arrive 10mins in advance to book your class). Salsa Club: 9:30pm to 3:30am (free when attending classes otherwise £5). Since 2004 Cubaneando! 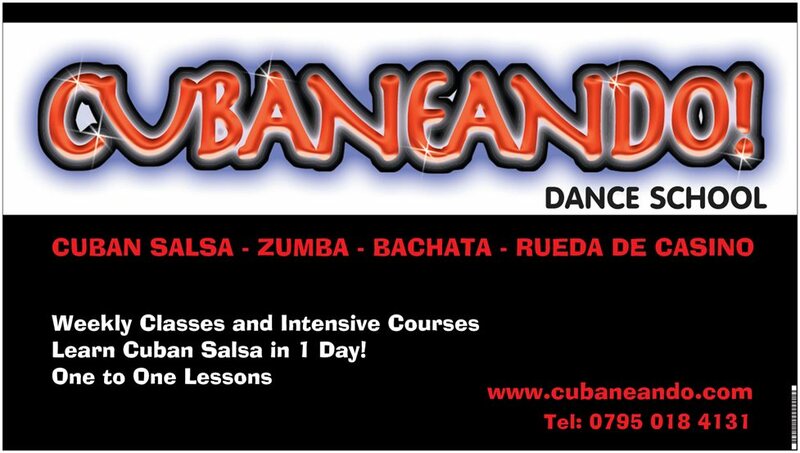 has been one of London’s leading promoters of authentic Cuban Salsa presenting dance classes, workshops & club nights.